I’ve never met a floral dress I didn’t like! This dress, and the entire collection for that matter, from Lela Rose, is one of my all time favorites! Question: What pieces in your closet have you regretted buying? When do you know when to let something go? Answer: Since I tend to shop quite a bit (and mostly online), I try to put all of my purchases through the following filters: does the price/value equation make sense (does the quality match the price), does it fit well (and if it doesn’t would tailoring be worth it), is it comfortable, will I wear it enough to justify the price, and is it too trendy (i.e., will I not wear it in two months). Of course, every once in a while, I will think an item passes the test and months later will realize that it really didn’t. For example, there have been a handful of designer pieces that I purchased and found to be not as comfortable as I originally thought, wouldn’t be worn enough, or were simply too trendy. The moment I recognize that, I almost immediately donate or sell to the Real Real. If I am not going to wear an item, and it is taking up space in my closet, it is time for it to go! Looking for something floral, but a bit more unexpected? 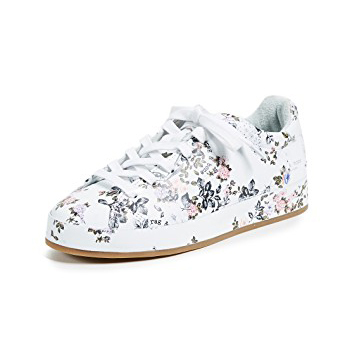 Loving these boy-meets-girl floral kicks. That floral dress is similar to the Clavin Klevin chiffon dress I just saw! Good one! When you are buying clothing online, how can you tell whether the quality matches the price and whether it will fit well? Knowing this would make so many people better online shoppers! Thank you in advance.